I wasn't really thinking of it as a analogue starter kit, but just using the similarities between models in DI and the ETB as precedence. If Shadow Spear only contains 3 Eliminators, then I would expect those same CAD sculpts to be the ETB Eliminators, if they have them at all. The same could be true for the Chaos Marines. The 3 previewed could be used for the (hopefully inevitable) ETB set, with any other Chaos Marines, such as a Melta carrier, being exclusive to the Shadow Spear or eventual updated Chaos Marine full kit. Good catch on the Lieutenant's icon--the most interesting part is that I don't see anyone else with the 'vanes' from Grav-Chutes other than him! He also doesn't have the 'antennae' that the other infantry have. Same with clocking the Eliminator up above 'Telion'. I wonder if maybe these guys will have some kind of 'sabotage' ability like Lias Issodon used to have? But WHY would you expect any of this? They flatout clocked it as full kits from the outset. They're not ETBs. A deep striking Lieutenant would be quite welcome for Successor Chapter armies that are 100% Primaris for fluff reasons so those Grave-Chute vanes give me hope. Since they specifically said "Shadowspear is a new battlebox. Like Forgebane, Tooth and Claw and Wake the Dead," all of which are 100% full kit releases, I was surprised when people here said they thought these would be easy to build kits. I only expect it for the Chaos Marines. It's getting tiresome that all the awesome new CSM are in large boxes and not in a kit of their own. So for sure they need a full kit, but than the ETB needs to be updated accordingly. 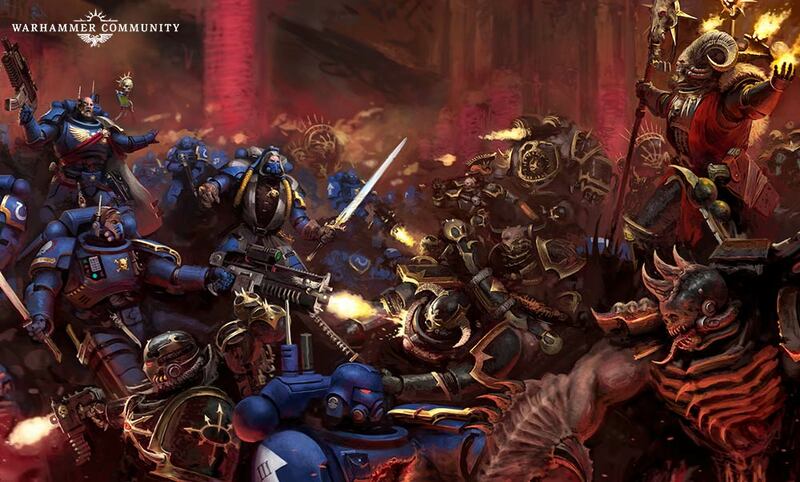 It would be weird to have these new scale Marines that look very different to the Chaos ETB Marines around at the same time. I don't "expect" the Snipers to be ETB, but I WANT them to be. I don't want to buy a unit of 5-10 models went all I want is 3.
yeah I don't expect these to be ETB unless they come with an updated rulebook. What people are forgetting about the recent AoS release is that it coincided with 2nd Edition release, and came with a rulebook. This just seems like a really nice battle box. Can't wait to see the rest of the models! What if they come in minimum units of 5? No one said anything about actual rules. This is all we currently have. You can assume as much as you want from it or you can ignore it completely if that suits you better. Why do some players want Oldmarines to be gone so badly? Given the different aesthetics and battlefield roles, I think there is space for both Oldmarines and Primaris to co-exist. The whole debate sounds more like a case of 'I told you that evil GeeDubz is screwing you over', than actually support for either of the marines. I think in a lot of cases it's less "I want old marines to go away" and more "if old marines are going away I want to know it sooner rather than later" or failing that "I want to know that when old marines go away I'll still be able to use my Landraiders/Predators/Storm Ravens". The purpose is to look nice. You think I'm ever going to play with the Gundam models I built? Nope. Then they are a hard pass for me. If I want 5-man SM snipers, I'll get Scouts. The box is undoubtedly cheaper than whatever price 5 Primaris will be. Hope they are not better than Vindicare's or they boost them in the new mini dex. On the fluff/rules side of the argument, carrying the right toxins for the job was what gave snipers in previous editions the ability to always wound things on fixed numbers, rather then using the S/T system. I don't believe toxins were mentioned much around the old snipers? It was 4+, whether you were an SM scout or an eldar ranger (and rangers used laser weapons). I know this probably ain't the place to ask, but do we actually know anything about this mini-dex yet? Back in 2nd, when they were Needle Sniper Rifles, they fired crystalized toxin slivers. I think that was carried forward, but a quick survey of my books didn’t find it. Needle sniper rifles still exist (such as the Ratling snipers IIRC), but some are definitely not, like the long-las used by most Imperial Guard snipers. Space Marine Scout snipers appear to be a laser weapon of some kind too, although they may be a needle rifle. Obviously Stalker snipers are bolt weapons. Needle sniper rifles actually used a laser to punch small holes in armor and then project the toxins. Used by Eldar, Marines, and Ratlings according to the 2nd ed wargear book. Which is why I thought the Marine snipers may be needle rifles- they have a power feed, but no obvious ammo feed. However, the power feed may be powering the laser part of a needle rifle, rather than a pure laser, and the needle ammo feed may just be subtle or something. IG uses long-lases, which are definitely pure laser- they are modified lasguns- excepting Ratlings, who don't use the long-las- their rifles are definitely needle rifles. So far GW's been pretty good about giving us new units that occupy a similer niche to old marines well not outright replacing the old units. I expect this will continue and the primaris snipers will fill a similer niche to scout snipers well having their own place as well. that said there's been demand for power armor snipers for awhile so.. Agreed. They same base rifle body is there with a new barrel, scope, magazine, and stock. I look at the bolt rifle as the same sort of thing as the M16/AR-15 family of rifles. There are sniper variants, carbines, and the like. The upper and lower receivers are largely unchanged, much like on the bolt rifle. Most of the weapons that Belisarius Cawl designed are very standardized. The difference between Bolt Rifles is often tiny, with a swap in magazine or scope. The difference in the Plasma Incinerators are similarly small, save for the Heavy option that has a backpack attachment. The bolt pistols that the Primaris range uses all share themes and styles that all seems to be based a short hop from the regular Bolt Rifle. So, that said, I'd expect other variations that the Primaris use to be similarly standardized. I just hope we also get a few other types of weapons. There's a marine in the background that looks to be wielding some sort of heavy weapon with a big round barrel discharging some energy. I hope that it's either a Flamer or Melta equivalent, something to give the Primaris some extra punch against the things they struggle with. Either way, I'm sure this will help shore up some of the weaknesses of All-Primaris armies. Would be great if the rumors are true and we finally get a light transport with them too. Heavy 1, 36” range, always wounds on a 2+, AP 1, D1 targets characters, and MW’s on a 6+ to wound. Seems pretty underwhelming, so it's in line with how sniper weapons have been statted historically. I won't bet against it. It will probably be longer range and have better AP than that. The Stalker Bolt Rifle is AP-2, I would bet the new bolt sniper rifle will have a -2. Especially if these guys are elites. I don't know if the wounding on 2+ is necessary either. That is the point of the mortal wounds.